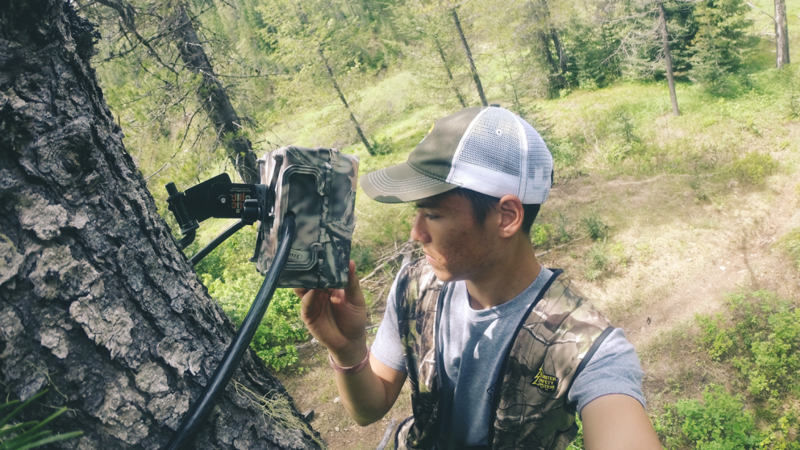 Daniel Choi is a Fisheries, Wildlife and Conservation Biology major. He grew up in Fayetteville, N.C. with 7 siblings. One of his favorite things to do as a kid was to explore the acres of woods behind his grandparents’ house, where he loved cutting his own path and being in the untouched forest. As he grew up, he was always curious about everything and loved to make new discoveries. Now a bit older, Choi loves to backpack, hike, climb and explore. He is also a great photographer in his spare time, and ultimately hopes to hold an active career in research as well as become a National Geographic photographer. During his freshman year, he participated in the Engaging Leaders Program, eventually becoming the Student Coordinator of the program during his sophomore year. Choi is also an officer in the Leopold Wildlife Club, a leader with CRU, an active participant of the University Honors Program as a University Honors Program Ambassador, a Community Assistant on East Campus and a TA for Plant Biology 200. 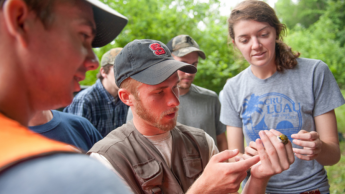 Check out our Fisheries, Wildlife and Conservation Biology undergraduate program. At 8am on Monday, May 22, I left Fayetteville, N.C. and began the first leg of my more than 3,000 mile trek to Coeur d’Alene, Idaho, home of the Panhandle Regional Office of the Idaho Department of Fish and Game, just 100 miles from Canada. After my fifth day of driving, I arrived. I was met by Laura Wolf, who I worked with for the next eight weeks, received a key and settled into a trailer home in the gravel parking lot within the compound. I didn’t have a single project for the summer. Instead, I worked with many different people doing many different things, which was an awesome way to get some valuable experience and skills, as well as hear a bunch of cool stories from many different people. My first day, I helped out with white pelican surveys around the region. Throughout the summer, I got to help place and retrieve large carnivore trail cameras, conduct amphibian surveys, check highway underpass cameras, setup grizzly bear DNA collection sites, plant wildlife corridor trees, help with public free fishing days, install and check duck boxes, do in-field elk necropsies, attend a wildlife drug administration workshop and make dove traps. 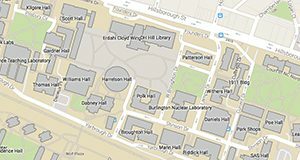 At the end of the summer, I attended the 2017 Ecological Society of America (ESA) annual meeting and presented a poster of my research from the previous summer. It was an incredible week full of meeting new people and learning new things. During this summer experience, my perspective on my career got a lot clearer. While I still don’t know what I’d like to do specifically, I do feel more comfortable about the future. It’s hard to describe, but it was a good summer. I definitely gained a lot of skills and experience, both in practical skills and personal characteristics. I also took the extra time I had to read, think and write a lot. I learned a lot of things on many topics and a lot about myself. Attending ESA also inspired me. Hearing about new topics and learning from so many professionals was a great experience, and I came away with many new ideas for research topics. How has this experience prepared you for your future career? Because I was bouncing around all summer, I got to learn many different skills. So, first, I gained a lot of practical field skills. Second, I got to learn how a government agency operates, which can help guide me when I look for a job. Lastly, I got to see that you can pull research questions from field work observations. How did this opportunity enhance your experience as a College of Natural Resources student? This experience allowed me to apply all that I had learned up until this point in college. Similarly, I learned techniques and theories on the job that I will now learn more about as I go through school. Some of my favorite moments were ones like this: 1) Driving an ATV across mountain grassy fields and feeling the cool breeze and warm sunrise rays on my face, 2) Considering using a plastic bag for my lunch and saying to myself, “Wait. That may have had tadpoles in it.” and 3) Scrambling on all fours around steep mountain sides, sliding down several feet at a time. Other interesting moments include walking up on a huckleberry picking black bear just 30 feet away, climbing steep rock faces with very flimsy shoes and yelling at mountain goats not to lick my legs. I’m not one to complain or to find negative things about an experience. As a result, there’s nothing I would change about my internship. Anything that might have been seen as negative, I used as an opportunity to learn. That being said, there was one moment that, in the moment itself, was very uncomfortable. I was doing amphibian surveys in some wetlands. I was in hip waders and very hot in the sun. Then, I started to walk through reed canary grass, a plant I quickly found I was allergic to. My eyes swelled up, my nose was runny and my throat was scratchy. In the moment, I was asking myself why I had chosen to be here and why I wasn’t somewhere else in comfort. However, looking back now, I’m glad for that experience to push through. I would recommend this experience to other students because of the opportunity to work with professionals, to gain field skills and to be surrounded by people who are passionately doing what your career goals are. 1) As much as we might wish the world judged you for each little skill you think you have, it pays to know people. Knowing people well and knowing people who know you well, is even better. Meeting people is an investment, so be real with the people you meet. Your hard work will pay off. 2) Time goes by fast. If you want to be successful, if you want to be satisfied when you look at your past, you need to use it well. I spent my evenings reading and learning and researching. I had time this summer that I will not have during the school year, and I made good use of it. 3) If you are determined, anything can be accomplished given time. This summer I spent my time being determined to learn from everything, to look past foolish things that do not matter, and to not dwell on things which pass away. If you want to be successful, live with a mindset that puts forth the things which you truly value. Have you completed any other hands-on experiences? Last summer I worked for a master’s student at Fort Bragg, N.C. on a project about Bachman’s Sparrows. I presented the research from experience at the 2017 annual ESA conference. It was during this experience that I gained a deeper desire to be in the research field. In the spring of 2016, I attended a study abroad trip during spring break to Nicaragua. It was a wildlife trip, where I learned about Nicaraguan wildlife, culture and coffee production. It was an interesting trip because I learned lots of information, practical skills and gained a lot of passion for the field and tropical ecology. I enjoy being a College of Natural Resources student for the community of the college. The support of my peers, the faculty and staff, and the programs of the college have pushed me to learn more and be more than I had thought was possible.